The figure illustrates a high-level configuration of LEC/AEC in the voice network access sub-system of a TDM or VoIP communication network. 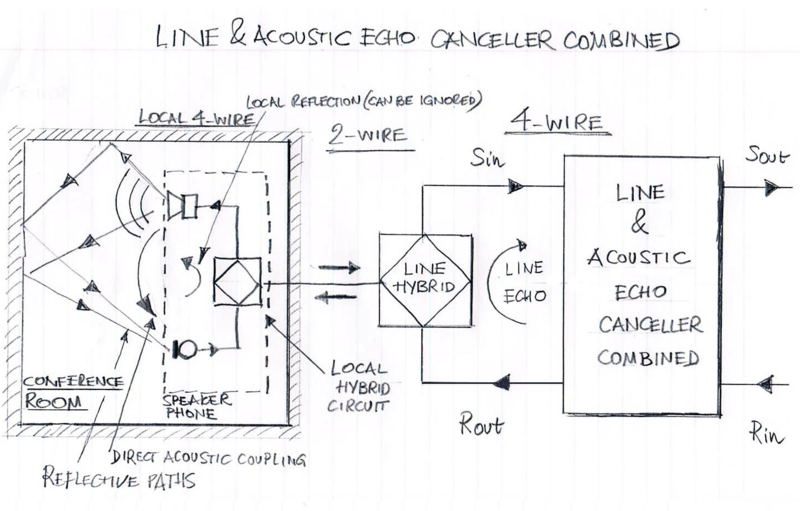 In order to perform adequately, the line and acoustic echo canceller combined (LAEC) is expected to have all basic features of line and acoustic echo cancellers and, specifically, be able to fast track echo path changes as well as adequately cover echo path lengths typically present in the acoustical environment such as a conference room, office or meeting room. In addition to that, the LAEC should be equipped with a non-linear processor that adequately removes residual echoes that cannot be sufficiently cancelled due to rapid changes of echo paths. Additional requirement for the non-linear processor in the LAEC is its ability to remove nonlinear effects caused by nonlinearities of the telephone set’s loudspeaker. The echo path coverage required by LAEC to adequate cancel early reflections in the acoustical environment depends of the size of the room as well as the physical nature of the reflective surfaces. VOCAL’s Line & acoustic echo canceller combined is reconfigurable and able to cancel both line and acoustic echoes up to 256 ms. Our software can be ported to a variety of DSP processors for customer evaluation. Please contact us to discuss your echo canceller application requirements.